It's strawberry season in Florida. I don't get it, but I'm not complaining, either! Anyway, don't let me fool you. 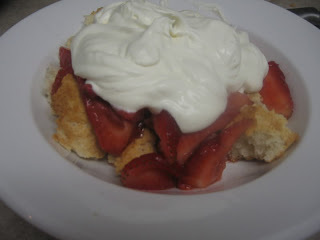 This shortcake is only homemade because I found out too late that I didn't have enough bisquick! But, it's not even any more work than that, and the cakes were fabulous. Mix strawberries with 1/4 cup sugar and refrigerate while juices develop, at least 30 minutes. To make whipped cream, I mixed 1 1/2 cups of heavy cream with as much confectioners sugar as I wanted to taste, using a mixer with a whisk application. What a gorgeous strawberry dessert! This is more unique than other I've seen, and it looks really good!